The Washington Nationals have an 8-7 record in this young season. * They have managed to actually have a better record since Ryan Zimmerman went down with an abdominal injury. They went 3-5 with Zimmerman and 5-2 without him. *To help all of us enjoy early-season baseball with more perspective, may we suggest reading Joe Posnanski's post on a 16-game baseball season. 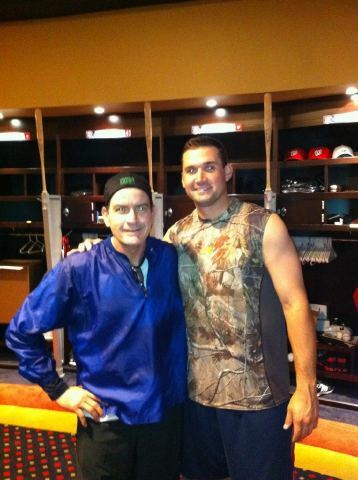 A few minutes ago, we got a glimpse of Ryan Zimmerman in the clubhouse with a special guest. At least Charlie Sheen's always been a baseball guy. Charlie Sheen is an interesting guy to run into anytime. Simply to name drop, I casually ran into him at the Peninsula Beverly Hills about ten years ago. I was in the lobby waiting for my father, while he walked in and asked for the spa because he had a massage. Back to baseball, it's funny for Zimmerman to run into Wild Thing while on the DL because of the common bond that they should both be doing rehab.